The new Microsoft Surface Book is supposed to be the next chapter in computing. But is Microsoft's new hybrid too ambitious and expensive? As for the MacBook Pro 13-inch, you know what you're getting, but is that still enough? The Surface Book's flexible hinge (which keeps its removable display steadfast) looks like it's from the future, but it leaves a distracting gap. Elsewhere, the gorgeous aluminium body and glass trackpad are distinctly Mac-like. Click a button and you can detach the Surface Book's 13.5-inch, 3,000 x 2,000-pixel touchscreen to watch movies, play games or doodle with a Surface Pen. Go large with the really rather lovely 512GB SSD model (£2,249) to banish storage woes. Two speedy Thunderbolt 2.0 ports, a vibrant 13-inch, 2,560 x 1,600-pixel Retina Display and a Force Touch trackpad make this a practical if less exciting choice. It does lack a touchscreen and pen support – so no direct scribbling here. Intel's sixth-generation processor and up to 16GB of RAM mean this hybrid can rip through tasks, and its Nvidia GTX 940M GPU can even handle modern games. Microsoft claims 12 hours of battery life, but we found it to be a bit less. Though it only packs Intel's fifth-gen processor, the Pro is no slouch. On the £1,399 model, you get 512GB of flash storage, but a lack of discrete graphics rules out heavy gaming. With ten hours of claimed battery life, it's great for road warriors. Windows 10 makes it easy to switch from clamshell to tablet mode in a snap. The desktop is massively improved since Windows 8, making productivity a breeze, but tablet mode is still clunky and the Windows Store still lacks apps. OS X El Capitan is fast and as solid as a rock. The MacBook opens instantly from sleep mode, and its keyboard is comfortable for long typing sessions. The App Store is full of apps designed to take advantage of the Retina Display. 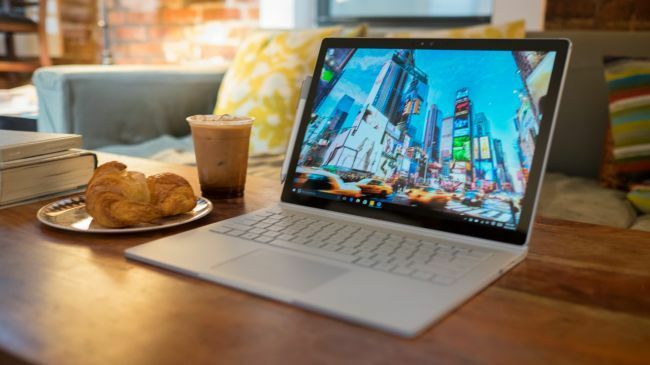 RATES You could replace both your laptop and tablet with the Surface Book; it's great for work and play. SLATES It's very expensive but it's also future-proof, so you won't need to buy another laptop for a while. SLATES It can't convert into a tablet, it lacks the latest CPU and there's no touchscreen.